That it hasn’t (yet) been holistically and easily describable in a single phrase is part of the beauty of Twitter to me. It does so many things for so many people. Whatever adjective or metaphor used, I think of Twitter as a service. Because that’s how I’ve always seen it. It’s a service driven by the people and operated for the people. And it is literally in service to people around the globe. First, the whole point of this post. 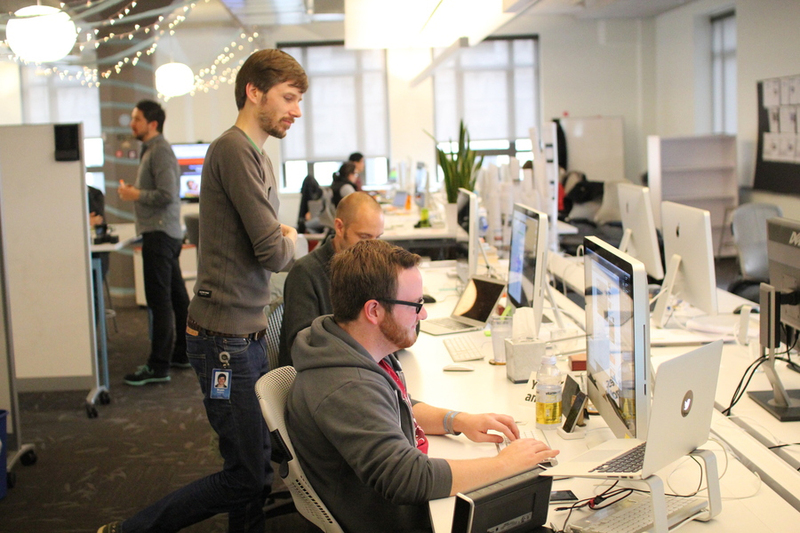 We’re expanding the Twitter Design Studio. Whether you’ve ever thought about working at Twitter or not, think about it now. We have a few open spots that we’re looking to fill in the next couple months. One of the desks in this photo of our studio could be yours. If we run out of space, we’ll make room for you. Starting today you’ll begin to notice a simplified Twitter bird. From now on, this bird will be the universally recognizable symbol of Twitter. Whether soaring high above the earth to take in a broad view, or flocking with other birds to achieve a common purpose, a bird in flight is the ultimate representation of freedom, hope and limitless possibility. “And, although I’m confident that I will always think my daughter is The Greatest Thing in the Universe, I’m also all too aware that this feeling will not always be reciprocated in quite that same way or with quite that same enthusiasm that we both enjoy right now. She won’t always run to my bed in footie jammies. I’ll only get that particularly noisy and personalized wake-up call for a little while. And, I only get a shot at it once a day. At almost exactly 6:00 AM Pacific Time. Those of you who saw my talks at either Future of Web Design in NYC, or at Webstock in Wellington may remember a segment where I urged delivering value as quickly as possible. In that segment, I compared the act of taking and sharing a photo with Hipstamatic, and the same in Instagram. I posited that one of the biggest reasons for Instagram’s runaway success is how quickly you can snap a photo, apply a filter, and share it with the world. It delivers value in three short steps, and it’s fun.